Herblock Was a Fine Political Cartoonist. Liberals Don't Need to Deify Him. Is there a more perversely inappropriate fate for a satirist than posthumous sanctification? Herbert Block, the editorial cartoonist who drew under the name Herblock, spent his long life practicing the vicious art of visual mockery, exaggerating the physiognomic peculiarity of politicians in order to call attention to their moral defects. Our mental images of Joseph McCarthy as a knuckle-dragging Neanderthal and Nixon as shifty, beady-eyed used car salesman owe infinitely more to Herblock’s pencil-and-ink polemics than to the photographic and filmic record. Many who met McCarthy thought he was ruggedly handsome: It took Herblock’s art to transform the anti-communist demagogue into a perpetually sweaty ape-man (and words, too: he's widely credited with coining the term McCarthyism). As with all good satirists, Herblock used cruel tactics for benevolent ends, but maliciousness was the very heart and soul of his creativity. How could he be a saint? Herblock, who died in 2001, was a giant of both liberal journalism and political cartooning, yet the new documentary Herblock: The Black and the White, which premieres Monday night on HBO, makes the mistake of turning him into a holy man. Oppressively celebratory and numbingly reverential, the film offers an endless parade of media panjandrums (from Thomas Friedman to Gwen Ifill to Jon Stewart) testifying to Herblock’s patriotism, his civic-mindedness, his love of humanity in all its myriad forms, his child-like innocence, his prescience, his humility, and innumerable other virtues. If we take director Michael Stevens's portrayal seriously, Herblock deserves not just canonization but perhaps apotheosis. The normally sensible Hendrik Hertzberg says that seeing Herblock in the halls of the Washington Post was "a little bit like as if Jesus himself were walking around the newsroom." Herblock was like Jesus in just one respect: He, too, has been ill-served by the cult that grew around him. The actual Herblock, a limited artist who achieved his best work when grappling with his political doppelgangers, was both more complicated and more fascinating than The Black and the White's plaster saint. Born in 1909, the son of a Chicago chemist, Herblock got his first job at the Chicago Daily News in 1929. His work received a national audience when he was hired to be a cartoonist for the Newspaper Enterprise Association (NEA), a syndication service popular with small-town papers. Originally a moderate Republican, Herblock was radicalized by the Great Depression and became an ardent supporter of Franklin Roosevelt. The cartoonist’s outspoken liberalism alienated him from his conservative employer, who might have fired him if he hadn’t won his first Pulitzer in 1942. After a stint in the Army, where he worked as a cartoonist and writer, he started working for the Washington Post in 1946, staying with the paper until his death in 2001. Herblock enjoyed a rare degree of editorial freedom at the Post. When the paper spiked a few of his anti-Eisenhower cartoons in 1952, the outcry from readers was so great that the publisher guaranteed him editorial autonomy. Visually, Herblock was solidly within the mainstream of twentieth-century American newspaper cartooning, a reliable professional but not a great innovator. The compositional solidity of Herblock’s drawing, evidenced in the fact that that our eyes always know who the main figure of a cartoon is, owe much to John T. McCutcheon, and his use of crayons to give texture to a drawing derived from Edmund Duffy. All these artists used a rigidly conventional visual language of easy-to-identify allegorical types. Their drawings are full of Uncle Sams, Statues of Liberty, GOP elephants and Democratic donkeys, with labels plastered on every character so we know who is who. This mode of cartooning flourished in the early twentieth century but was already becoming old-fashioned when Herblock hit his stride with the Post in the 1950s. McCutcheon and Duffy are largely forgotten except by the hard-core cartooning cognoscenti, and the majority of Herblock’s work is likely to join their in oblivion. Topical newspaper cartooning is a relentlessly time-sensitive art, keyed to the day’s headline. A cartoon will be viewed and talked about maybe for a day, but six months later needs an extended footnote to be understood. An artist only transcends that brutal ephemerality when a cartoon so perfectly encapsulates a political moment that it becomes part of our historical memory: We can’t understand Boss Tweed’s New York except via Thomas Nast’s thick-hatched sketches of bloated corruption, and the best way of recovering the shock of the Hitler-Stalin Pact is through David Low’s cartoon of the two dictators daintily bowing to each other as if they were at a dinner party. What will preserve our memory of Herblock are the cartoons that he did about the two politicians he seems to have hated the most, McCarthy and Nixon. As a stalwart New Deal Democrat, Herblock had a visceral antagonism toward them, perhaps because both men embodied anti-liberalism not just as a policy but as a personal style. Herblock’s cartoons of these two Republicans have an animus that set them apart from the general ruck of his oeuvre. But Herblock also seems to have felt some affinity for these men—perhaps because, like McCarthy and Nixon, he was a mud-slinger by trade (albeit one working for the greater good). His sympathy was especially evident when McCarthy and Nixon fell from grace. Look at Herblock’s "Carry on, Lads" showing a wounded McCarthy passing on his tarbrush to two eager disciples, one of them a young Nixon. Like King Kong or Dr. Frankenstein’s monster, Herblock’s McCarthy achieves a measure of pathetic dignity in defeat. Herblock’s drawings of Nixon during the last days of his presidency have that same quality of disgust tempered by pity. In the 1974 cartoon "Un-Indicted Co-Conspirator" a furtive Nixon faces a table of empty chairs, like Macbeth confronting the ghosts of his misdeeds. 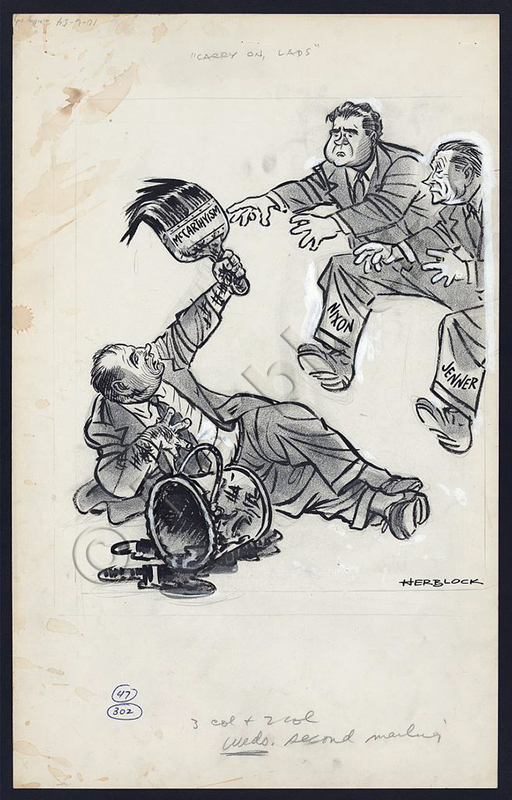 Even in his best work, Herblock fell short of the highest achievements of political cartooning. He was a middling caricaturist, certainly far short of a master like David Levine. In many of his drawings, if Herblock didn’t provide a helpful label (FDR, Nixon) we might not be sure who we were supposed to be looking at. Herblock’s cartoons also seem paunchy and even heavy compared to Levine’s deft linework, where each stroke is in the service of total image. Nor was Herblock especially astute in his psychological appraisals of politicians. 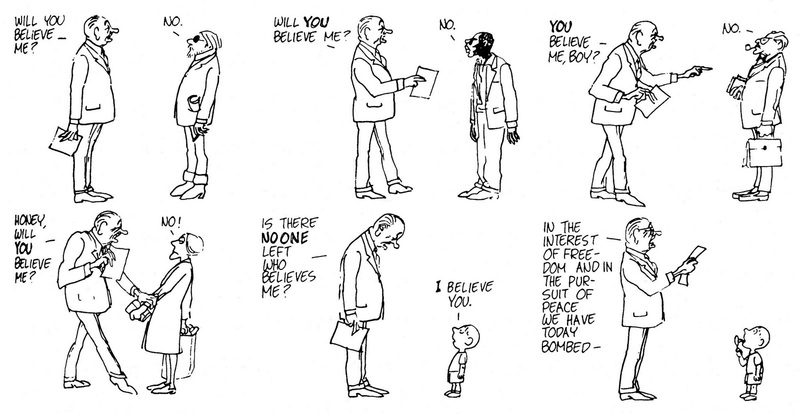 Jules Feiffer’s great strips of the 1960s dig much deeper into the inner life of Lyndon Johnson and Robert Kennedy than Herblock ever did. Herblock’s LBJ is just a boorish hick, very different than the tormented man we find in Feiffer. As excessive the praise in The Black and the White is, it's not surprising that Stewart, Hertzberg, and other liberals would deify Herblock, for his greatest legacy might well be in reminding us of the solid good sense of twentieth-century progressivism. He was anti-fascist in the 1930s, prophetic in his critique of appeasement, an anti-communist who was among the most vocal critics of McCarthyism, an opponent of racial segregation from the late 1940s onward, and well-ahead of his fellow liberals in warning of the folly of the Vietnam War. Hardly a saint and only intermittently a major political artist, Herblock nonetheless was influential and on the right side of history. But it's exactly that: history. Herblock flourished in the golden age of the American newspaper, and his mockery of Nixon and McCarthy carried a punch because papers like the Post were central to the culture in a way they no longer are. It's telling that none of today's most talented young political cartoonists, like Matt Bors and Jen Sorensen, have a newspaper staff position. So when Bob Woodward and Ben Bradlee reminiscence in The Black and the White about Herblock's greatness, it feels less like a celebration than a wake. The world that made Herblock possible is gone.